Advance Agro is planning to expand its pulp and paper operations. In an attempt to improve its image in Australia the company has hired a PR firm. The result, not surprisingly, is greenwash. Advance Agro is one of Thailand’s largest pulp and paper companies, producing 427,000 tonnes of pulp and 470,000 tonnes of paper a year. The company markets its “Double A” brand of photocopy paper with a series of environmental claims. In May 2007, an Australian company called Access Economics added to these claims with a report titled “Environmental Benefits of Double A Paper”. 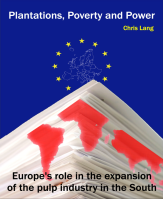 The report compares pulp and paper operations in several countries by putting a price on the environmental impacts of pulp production and concludes that the environmental costs of Double A paper are less than any of the other paper mills examined. Since the report was commissioned by Advance Agro and Mango Communications (an Australian public relations company hired by Advance Agro since November 2006) we shouldn’t be too surprised. However, it is revealing to look at how Advance Agro’s consultants reached their conclusion. First, Access Economics ignores Advance Agro’s track record. “No native forests are damaged in Double A’s operations,” claims the report. 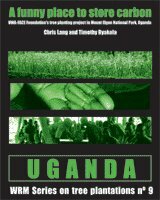 But forests were destroyed in order to establish plantations for Advance Agro’s operations. Advance Agro is part of the Soon Hua Seng group. In 1990, one hundred employees of Suan Kitti (a subsidiary of Soon Hua Seng) were arrested for illegally logging forest on 1,600 hectares of Forest Reserve land in Chachoengsao province in preparation for establishing plantations to feed Double A’s pulp mills. Suan Kitti Reforestation was also charged with illegally logging in a 4,800 hectares area in Prachinburi province. Soon Hua Seng group’s pulp mill was to be called the “Suan Kitti pulp mill”, but after this scandal, the company changed the name to Advance Agro. “The Access Economics report is based on Double A’s current production policies and farmed tree processes,” Thirawit Leetavorn, regional senior executive vice-president at Advance Agro, told WRM by e-mail. Second, Access Economics fudges the pollution data. According to a footnote to a table in an appendix to the report, no data was available about Advance Agro’s wastewater discharges. So Access Economics uses a figure produced from the average of two Finnish mills, “on the grounds that the Thai plant producing Double A paper uses Finnish technology”. 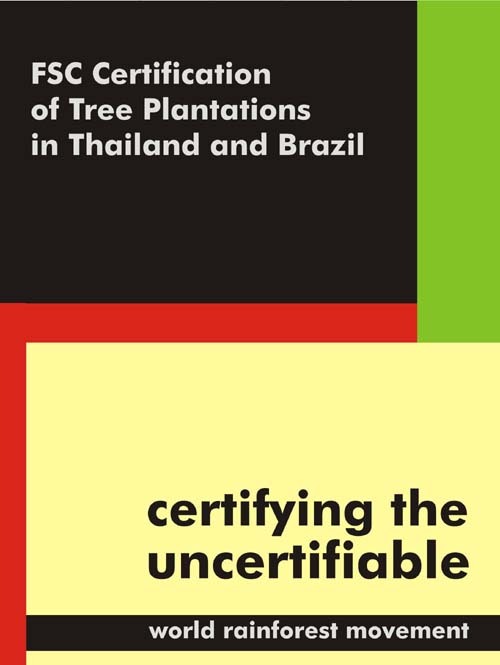 As such information is a crucial part of any analysis of environmental impacts of pulp and paper production, I asked Thirawit Leetavorn to explain why Advance Agro did not provide this information. His answer, in full, was “no”. Absorbable Organic Halides (AOX) are a group of chemical compounds produced when chlorine reacts with wood during the bleaching process of pulp manufacture. According to Access Economics, Double A’s AOX discharge is 2.00 kilogrammes per air dried tonne of pulp produced -the highest of any of the mills considered (more than double the figure given as the average in the US, for example). This fact is not mentioned anywhere in the report. Third, Access Economics tries to make Advance Agro’s plantations disappear. According to Access Economics, Advance Agro sources its wood from “farmed eucalyptus trees grown by farmers along the edges of rice plantations”. The company claims to have contracts with one million farmers. Thirawit Leetavorn sent me some nice photographs of eucalyptus trees planted along the edges of rice fields. “No, we do not have industrial tree plantations,” he wrote in answer to my question about what area of plantations the company has. Four years ago WRM visited Thailand. We talked to villagers living near the plantations and heard how villagers had sold their land to the company. We heard how the company had established eucalyptus plantations right up to villagers’ rice fields. And we saw large areas of eucalyptus plantations. Advance Agro is currently planning to build a new 500,000 tonnes a year pulp mill and a 500,000 tonnes a year paper mill. Finnish consulting firm Pöyry completed a feasibility study in 2006. Advance Agro has submitted an environmental impact assessment to the Thai authorities and is in negotiations with Mitsubishi (Japan), Voith (Germany) and Metso (Finland) about the supply of machinery. Access Economic’s report is a marketing tool aimed at expanding Double A’s sales in Australia in anticipation of the new pulp and paper capacity expansion. The report is greenwash. “Environmental Benefits of Double A Paper“, Access Economics, May 2007. 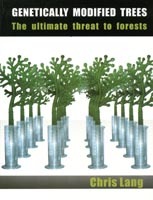 Keith Barney (2005) “At the Supply Edge: Thailand’s Forest Policies, Plantation Sector, and Commodity Export Links With China“, Forest Trends, Center for International Forestry Research, The York Center for Asian Research, p. 1-2. 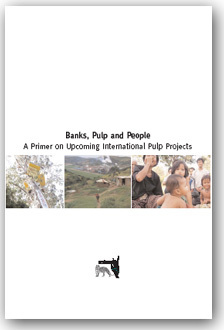 Sonnenfeld, D. (1999) Vikings and Tigers: Finland, Sweden, and adoption of environmental technologies in Southeast Asia’s pulp and paper industries. Journal of World-Systems Research, Vol. 5, No. 1, Spring 1999, p.18. Email from Thirawit Leetavorn to Chris Lang, 22 June 2007. 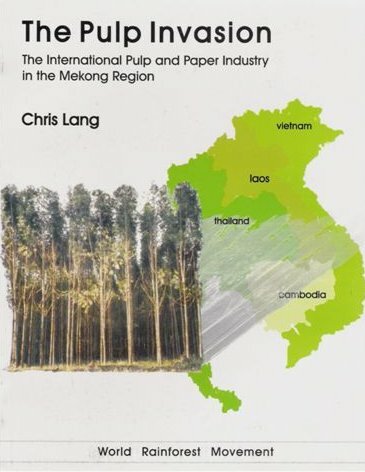 Chris Lang (2003) “Thailand: Eucalyptus, encroachment, deforestation and pollution linked to pulp and paper company“, World Rainforest Movement Bulletin no 70, May 2003. Access Economics (2007), p. 21. Elsewhere in the report, Access Economics states that wastewater is “used to irrigate the trees”. Justin Toland (2006) “A Trip to Thailand: Thai Paper and Advance Agro get in shape for domestic growth and competition from China”, Pulp and Paper International, December 2006, p. 14. Justin Toland (2006) p. 15. “AA to build Bt12-bn paper plant: New facility will lift annual capacity to one million tonnes“, The Nation, 20 April 2007.